Looking for a Used Sentra in your area? CarGurus has 54,187 nationwide Sentra listings starting at $1,690. 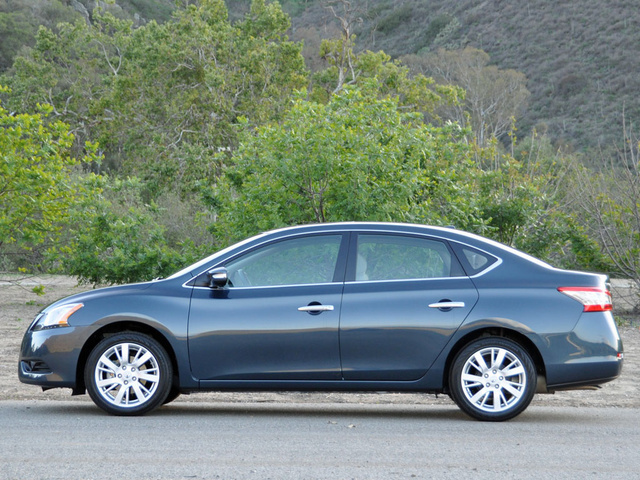 Wondering what the best thing is about the 2014 Nissan Sentra? This is a surprisingly roomy and comfortable compact car. It’s easy to tell when someone is “phoning it in.” That’s the feeling I get about Nissan from the 2014 Sentra, a roomy and relatively fuel-efficient small car that otherwise fails to distinguish itself in a popular vehicle segment loaded with compelling alternative choices. Given the competitive landscape, you’d think Nissan would’ve swung for the fences when it redesigned the Sentra last year. If you suffer from insomnia, Nissan has a cure, and it’s called the 2014 Sentra. From the way the Sentra looks to the way it drives, this is one boring car. Nissan offers the 2014 Sentra in basic S, popular SV, sporty SR and upscale SL trims. Additionally, Nissan S and SV models are available with a Fuel Economy Plus (FE+) package that bumps the highway mileage estimate from 39 to 40 mpg. Prices start at $16,800 for a Sentra S with a manual transmission and rise to as high as $24,675 for a Sentra SL with all the factory-installed extras. I tested the Sentra SL, my favorite because it’s not making any visual promises that it can’t keep (like the Sentra SR does). The paint color is called Graphite Blue, and my test car came with Marble Gray cloth seats, carpeted floor mats, a carpeted trunk mat, a Premium Package and a Navigation Package for a total of $22,570 including the $810 destination charge. When I look at the Sentra, I see an inoffensively styled car that is generically appealing but easy to dismiss. Aside from the arching hood and front fenders, which align the Sentra with other Nissan models, nary a discerning design element exists, resulting in a wallflower of an automobile. Nissan tries to add some fancy in the form of LED running lights, but they only serve to draw attention to the lack of visual pizzazz anywhere else on the car. The 17-inch aluminum wheels on the Sentra SL model look good, but I speak from experience when I tell you that they’re hard to clean. Moving to the interior, symmetry rules, an aesthetic I prefer. The Sentra’s clean look and contemporary tones, textures and glosses are appealing, and the fake wood trim is used sparingly enough that it doesn’t offend. There’s nothing engaging about this compact car’s driving dynamics, though when you pitch one into a corner, there’s a hint of potential evident in the Sentra’s chassis and suspension. Otherwise, this Nissan is a droning, dull, wooden conveyance irritatingly aimed at what the company must have calculated to be a lowest-common-denominator kind of driver. 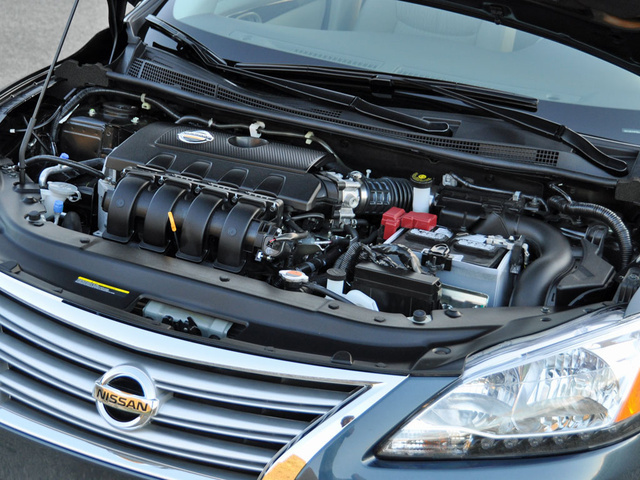 Nissan installs a 1.8-liter 4-cylinder engine into every version of the 2014 Sentra, one making 130 horsepower at 6,000 rpm and 128 lb-ft of torque at 3,600 rpm. That ain’t much, but with the heaviest version of the car tipping the scales at 2,866 pounds, it proves adequate. Get the basic Sentra S trim and you’ll be able to row your own gears, thanks to a 6-speed manual gearbox, but every other version of the car has a continuously variable transmission (CVT) that makes the most of the available power. The idea here is to extract maximum fuel economy from the engine, and the EPA says a Sentra will get 30 mpg in the city, 39 on the highway, and 34 in combined driving. I got 29.8 mpg in an even mix of city and highway driving combined with a total elevation change of 1,700 feet. Granted, I did not activate the car’s Econ or Sport driving modes for an extended period of time, but I certainly expected to see better than 30 mpg on my test loop. Nissan’s Xtronic CVT is fairly sophisticated, the latest version designed to reduce engine revs ASAP in order to eliminate this type of powertrain’s characteristic drone. Around town, you’ll barely notice it, and on the highway the powertrain is remarkably quiet. Under full-throttle acceleration, it even mimics an upshift or two for a more natural sound and feel, and during a hill climb the Sentra effortlessly maintained 75 mph, whizzing past slower drivers who apparently don’t know they need to push harder on the accelerator pedal to get from Camarillo, Calif., to Thousand Oaks. However, the Sentra isn’t close to quick, and I strongly advise against attempts to take advantage of questionably sized holes in traffic to merge with the flow, pass slower vehicles or turn left through a brief gap. In fact, if you’re accelerating up a freeway on-ramp with passengers aboard, they might be inclined to jump out and push to help the Sentra get up to speed. Once you get the Sentra moving, the steering feels too light and disconnected on center as well as artificially heavy off-center, traits most noticeable and irritating on the highway. In the city or suburbs, where speeds are lower and the driver is regularly changing lanes or taking corners, the steering exhibits more natural feel and response. That’s never the case for the brake pedal, though, which is hard to modulate in traffic and provides inconsistent response most of the time. I blame the fact that the Sentra has rear drum brakes unless you get the Driver Package for the SR trim or the Leather Package for the SL trim. Yep. The Leather Package contains the rear disc brakes. Oy. Given my opinions about how the Sentra drives in the environments where its owners are going to spend the vast majority of their time, you might wonder why I even bothered to toss it down Mulholland Highway, a twisty two-lane ribbon of blacktop laced across the Santa Monica Mountains near Malibu, Calif. The answer? Because I do that with every test car. I’m glad I did, because it was here that the Sentra most impressed me. Somebody at Nissan knows how to engineer a chassis and suspension, and with support from P205/50R17 Continental ContiProContact all-season tires and a relatively light curb weight, my Sentra SL handled the 25-mph hairpin corners and decreasing-radius curves with unexpected levels of talent. Still, the 2014 Sentra has a long way to go before it could be called remotely pleasurable to drive. A car like this doesn’t need to be a sport sedan, and I’m not looking for Nissan to resurrect the fabled SE-R model. But the Sentra definitely needs greater refinement and more engaging and nimble dynamics, traits that every Honda Civic delivers with every push of the ignition button. If you’re wondering what the best thing is about the 2014 Nissan Sentra, I’ve got the answer. This is a surprisingly roomy and comfortable compact car. In fact, it doesn’t look or feel small inside and, for the most part, Nissan employs materials that feel durable and appear upscale. Thanks to a wide range of driver’s-seat and steering-wheel adjustments, it's easy to get comfortable in the Sentra. The front passenger’s seat doesn’t offer height adjustment, but it’s not necessary, because the chair sits high off the floor. Unfortunately, Nissan puts soft-touch material on the top of the dashboard, where nobody is likely to touch it, rather than on the upper door panels, where lots of people tend to rest an arm or elbow, but otherwise I’ve got no complaints. The rear seat is very spacious, and occupants sit up high with excellent thigh support and plenty of headroom. Families with children should take note of the amount of space in the Sentra’s back seat, as installing a rear-facing child safety seat should be no trouble, and once the kids get older, they’ll have a tough time kicking the seatbacks and irritating Mom and Dad. Additionally, the Sentra has a gigantic trunk. At 15.1 cubic feet, it’s nearly as large as what most midsize sedans offer, and the 60/40-split folding rear seat expands the space when necessary. I tossed my kids’ stroller into the Sentra without any effort, again underlining how a Sentra can serve double duty as a commuter car and a family car. Circling back around to the interior, the Sentra’s controls are easy to find, understand and use. There is room for improvement though. For example, I can’t figure out why the fuel door release is located right next to the hood release down at the bottom of the left side of the dashboard. I’m also mystified as to why there’s an ashtray forward of the gear selector rather than a storage bin equipped with a USB port and auxiliary audio input jack. The Sentra SL has those two features, but they’re in the tiny center console where they’re hard to access and take up precious space. Check this out: To get Bluetooth and a USB port inside a 2014 Nissan Sentra, you need to buy the most expensive SL trim, or you need to pay $1,000 for an option package that contains it. While that’s not terribly impressive, at least Nissan bundles it with appealing upgrades, excluding only the base Sentra S trim from the festivities. A Premium Package for the SV, SR and SL trims installs an 8-speaker premium Bose audio system in the Sentra, and a Navigation Package is also available for those three versions of the car. 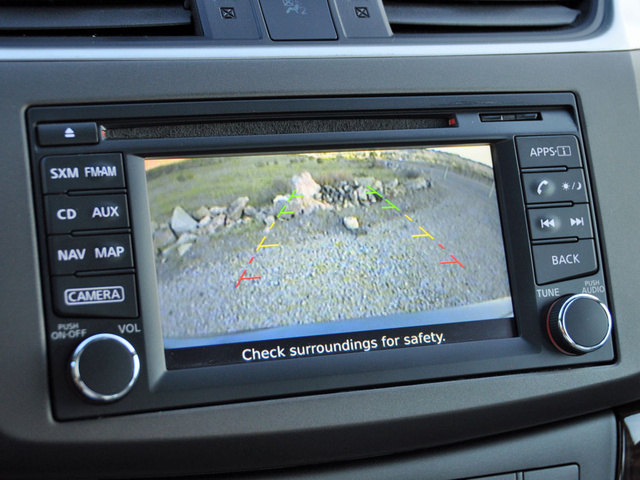 Highlights of that package include a navigation system with voice recognition, NissanConnect technology and a reversing camera. 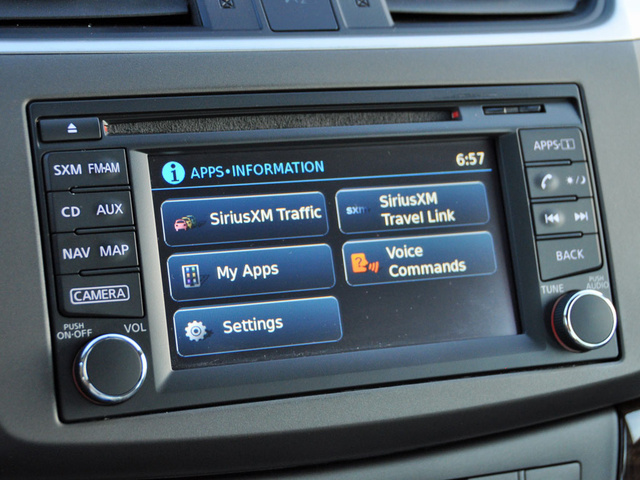 NissanConnect describes the automaker’s connectivity and mobile application services. Key features include a hands-free text-messaging assistant, Bluetooth streaming audio, satellite radio, Internet radio, access to Facebook and Twitter, real-time traffic and weather reports, local fuel prices, Google point-of-interest search and more. Nissan provides 3 years of complimentary NissanConnect Apps service; thereafter, a subscription is necessary to continue service. Currently, the cost is about $20 annually. I find NissanConnect both useful and easy to understand. The glare-prone screen inside the Sentra measures just 5.8 inches, though, making some of the virtual buttons too small for my stubby fingers. It’s a good thing Nissan supplies a big power and volume knob, a big tuning knob and large buttons with clear markings on either side of the screen. Plus, the system offers a number of ways to customize the display and how things work. Optional for the Sentra SR and standard for the Sentra SL, Nissan’s Easy Fill Tire Alert system is a simple yet useful feature that takes the guesswork out of checking your car’s tire pressure. Just push the air hose onto the tire, start filling it with air, and the system will automatically chirp the horn when you’ve reached the proper tire pressure. Because properly inflated tires are so important to maximizing fuel economy, maintaining handling and remaining safe on the road, Nissan really ought to make this feature standard on all Sentras. Given how roomy the Sentra’s interior and trunk are, it’s a shame this car doesn’t perform better in crash tests. Better scores would go a long way toward the Sentra getting my stamp of approval as a great family car for people on a tight budget. The National Highway Traffic Safety Administration (NHTSA) gives the Sentra an overall crash-protection rating of 4 stars, mainly because in the frontal-impact test the car delivers a 3-star level of protection to the front passenger. The Insurance Institute for Highway Safety (IIHS) gives the Sentra its highest rating of Good in all assessments except for the small overlap frontal-impact test. For that evaluation, the car receives a Poor rating. Look, I understand that the IIHS moved the ball right when the latest version of the Sentra was introduced and that the car was engineered to excel to the previous standard. But that doesn’t explain the 3-star NHTSA rating. Plus, Nissan’s archrival Honda approved the budget necessary to upgrade the Civic’s structure just one year after that model was completely redesigned. The result? The Civic earns a Top Safety Pick thanks to an impressive performance in the new small-overlap IIHS test. Evidently, that approval hasn’t been granted during budget discussions at Nissan. So far, Nissan hasn’t convinced me that a 2014 Sentra is a smart buy, and when running the numbers the car still strikes me as average. For example, TrueCar says most people who buy a Sentra pay invoice for the car. At first, I thought that simply could not be accurate. But then I checked out the deals Nissan is offering for this model as this review is written in early April. Let’s see. You can finance one with no interest, but only for 36 months. Alternatively, you can take advantage of a $500 rebate. Or you can lease a Sentra SV with a couple of upgrades for 36 months at $179 per month plus tax, after putting $2,399 into the pot at lease signing. None of these are particularly competitive deals. You’d think Nissan could be more competitive on the leasing side, seeing as how ALG thinks a Sentra will hold its value better than many competitors, evident in the car’s 4-star depreciation rating. And with Consumer Reports and J.D. Power telling consumers that quality and reliability are average at best, Nissan ought to want to make its compact car more compelling in terms of price. Maybe the company thinks that the Sentra’s impressive fuel economy ratings will move the metal. Too bad that in my experience the Sentra averaged 29.8 mpg, coming in just under the EPA’s fuel economy rating of 30 mpg. And I didn’t drive solely in the city. 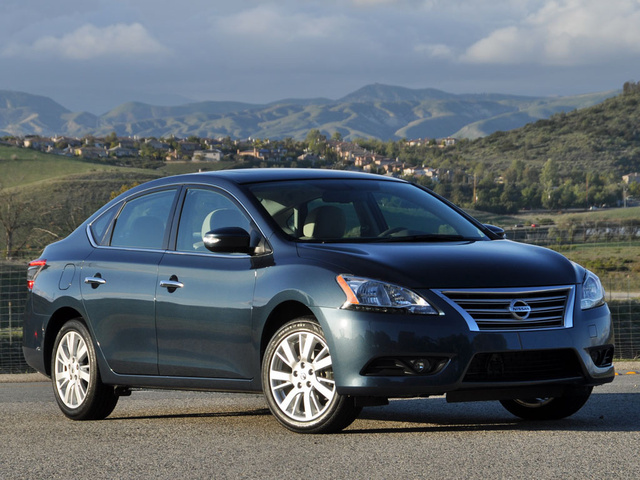 What's your take on the 2014 Nissan Sentra? Tyler Do not buy this car in any way shape or form. 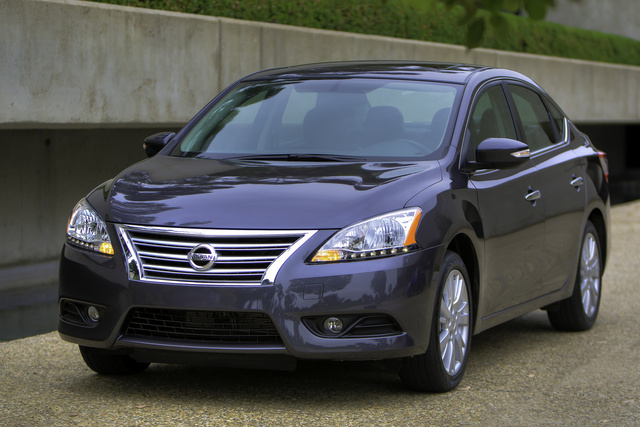 The 2014 Nissan Sentra has a sever issue with the CVT. A factory rebuilt CVT will cost you $4500 and even with proper maintenance you would be extremely lucky to get 100k out of it. My first CVT went out at 13k miles. Thank god for the warranty my second went out at 120k. I paid to put one (#3) in and within a month it went out. Warranty! They put in another one and it did not even make it past the test drive from the shop (#4) so they put in #5. Well that made it 1 year and now even #5 is shot. 150k all interstate miles, 5 CVT transmissions on a car I have meticulously maintained. The only other issue I have had it the radiator fan went out. If it were not for the CVT the rest of the car has done very well. 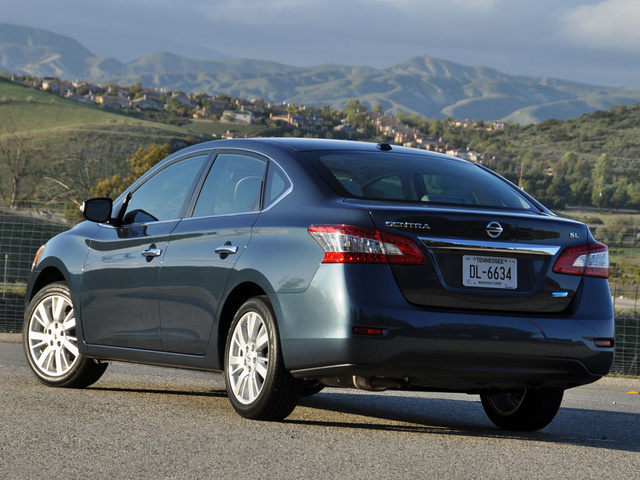 Users ranked 2014 Nissan Sentra against other cars which they drove/owned. Each ranking was based on 9 categories. Here is the summary of top rankings. Have you driven a 2014 Nissan Sentra? Hi a friend want yo Dell me a Nissan Sentra 2014. 17000 Miles ...the question is that the car suddenly loses power what does that mean??? Transmisión? Sensor? Will 195 65r15 tires fit my 2014 nissan sentra sv?